Occasionally women will write to ask me if their training plan should be changed to accommodate their monthly menstrual cycle. Or, they ask how to change a training plan to work around their monthly cycle. Most women will agree that they don’t feel their best a few days prior to, and the first couple days of the cycle. Common discomfort symptoms include lower abdominal cramps, headache, backache, fatigue, breast soreness or tenderness, weight gain, gastrointestinal problems, diarrhea, and unpredictable bowel movements. Sounds fun, right? For some women, the symptoms are more of a nuisance. For others, the symptoms are uncomfortable and can certainly cause some irritability. For some 10 percent of women, premenstrual symptoms and early days of the cycle are rough enough to be considered life-disturbing. For those with debilitating symptoms, try to keep a log of physical and psychological issues. Keep track of the timing and see if you notice any patterns. Make notations on exercise, work load and nutrition habits. You may see a pattern that you can resolve on your own. If you are unable to resolve unbearable symptoms, take your information logs to your physician to see if they can help. The women with severe symptoms may need to move key workouts to another day of the week. If you do this, try not to stack too many key or tough workouts back to back. Many women find that doing some physical activity can reduce or eliminate some of the symptoms. If you fall into this category and your cycle is very predictable, plan high intensity workouts to avoid days when symptoms are predicted to be the worst. What you cannot move around is a planned event or race. A race date is fixed. If your symptoms are truly debilitating, sadly, you may need to skip events that fall at the wrong time of your cycle. When I did research for my book, Bicycling for Women I found that just before and during menstruation, the luteal phase, estrogen levels are at their lowest – but – aerobic capacity is at its peak and fat burning is increased, compared to other times during the cycle. 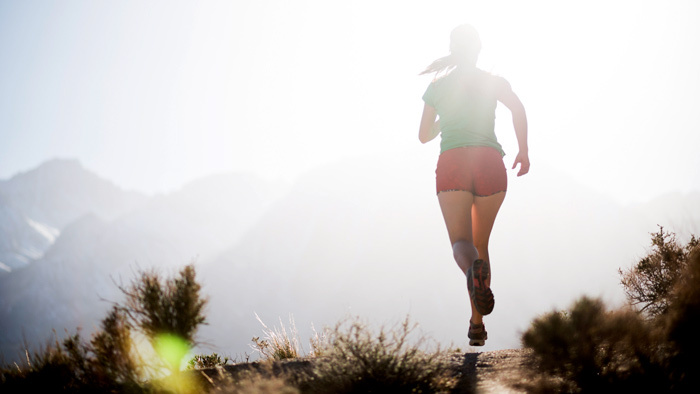 Studies on normally menstruating runners have shown that fat furnished 70 percent of the energy at 35 percent VO2max, 58 percent of the energy at 60 percent VO2max, and 46 percent of the energy at 75 percent VO2max during the luteal phase. Compare those values with the midfollicular phase, in which 52 percent of the energy is provided by fat at 35 percent VO2max, 43 percent of the energy at 60 percent VO2max, and 39 percent of the energy at 75 percent VO2max. Studies have shown that women have won medals and set world records at every phase of the menstrual cycle. Many women have made a conscious decision to not let premenstrual and menstrual symptoms get in the way of an important workout or race. They carry on and don’t let the hassles of the menstrual cycle get in the way of personal success. There is no stopping them from achieving success. Unless you are a woman that suffers debilitating pre-menstrual and menstrual cycle problems, there is no need to modify a training plan to accommodate particular phases of the cycle.